How to avoid Cancellation? 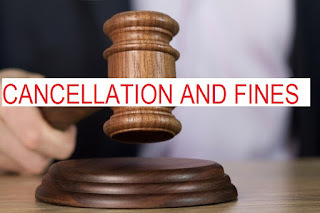 how to check Cancellation status? how to to check visa cancellation online? how to check if my visa is cancelled or not? How to check Visa fines in UAE? How to check visa fines? how to check overstay fines? how to check tourist visa fines? how to check visit visa status? how to check tourist visa status? how to check visit visa validity? As all of our visitors know that we were out of Service due to some Technical issues but we are back Live now with some advance Query method & techniques in place as of today, we will ensure that all of your queries will be answered as soon as possible.We very much appreciate your support and hope that you will remain a valued visitors of our Blog in Future. Please note that we are not Recruiters, we do not have any Company nor Business here in United Arab Emirates, even we do not have any Website. It is a community based blog without any sort of Payments and Fees system. Aim of UAE LABOURS BLOG is to provide you a very high level of free service which give you some sort of support in your future plans. As everyone here knows that we are out of Service from 1 year and their are more than 1 thousand Comments not answered yet, so we are starting new FAQ/Queries/Comments service. This Post is regarding Cancellation & Fines Issues. For related queries like Ban, Black list and other visa issues will be start soon. Feel free to ask,we will try to reply As soon as possible. Visiting us on a regular basis will give you updated Articles, UAE Labour Law, New Rules & Regulations, Updated & confirm Jobs, News, Entertainment and the most important answers of questions you've asked or keen to ask and much more.. Please click below links now, and enjoy our free service on all platforms. Note:Urdu, Hindi and Arabic comments system is started. ملاحظة: بدء الخدمة اردو، ہندی والعربية، ويسمح لك لكتابة. My ex employer didn't pay me one month annual leave and then they marked me as absconded while I was on vacation. When I come back MOL removed absconded but gave me 1year ban. Is there any chance to remove the ban? Question:1 Are you still in UAE or out of Country? Im back in my country. While I was there I tried to apply to remove the ban. They gave in instructions in MOL. Since my grace period expired I went back home. And then I found out they didnt accept it. Documents required For those who have High School attested Certificate they need 5,000 AED Monthly Salary. For those who have Diploma attested Certificate they need 7,000 AED Monthly Salary. For those who have Attested Bachelor & above they need 12,000 AED Monthly Salary. I was employed in a firm in Ajman on 20/06/2012 by the owner who actually is a local, on 26/06/2012 he has issued my per work permit and then on 30/06/2012 he gave me some money which is 15000 AED to buy some equipment for the office, I gave this amount to one of my best best friend to buy those equipment from a shop he claimed that he know them and they'll consider the price buy instead he took the money and returned in his own country without return, I've told my sponsor about the matter but he disbelieved me and said you robed the money and then he told me don't come in my office until I call you back, during this period he filed an absconding case against me in Ministry of Labor and General Directorate of Residency and Foreigners Affairs without my knowledge after 10 to 11 months I came to know when his PRO told me that he filed an absconding case against me, I've sent my friend to labor office to inquire how to lift the report but they said it's almost over 6 months so no chance, on 10/10/2014 I've caught by Dubai Police and deported to my country Bangladesh on 10/11/2014. Please let me know if I can lift my blacklist and return to UAE again, and I yes how much it will cost and how can my sources contact you.... my relatives and friends in Dubai are ready to pay the ban lifting fees. 1- My sponsor issued my entry permit and made the amendment of status without my presence through his friends in the GDRFA, I've tried to solve this matter before my deportation with my sponsor but he started demanding more money AED 25000 without absconding case lifting amount. 2- First time I came in UAE when I was 2 years old (1990) with my family members, I've completed my studies in UAE. Dear Sir, I didn't get any reply regarding my above matter. Mr. ZAFAR we are really sorry for the delay. Please clarify, how long you was lived illegal after your sponsor (employee) rejected you for the first time..! I was working in Sharjah on a limited contract and my labor card expired on: 27th June 2015, I resigned and they cancelled me on 31st June 2015. I gave the cancellation paper and my passport copy to my new employer in Sharjah and left the country on 26th July 2015. On 28th July 2015 my new employer applied for my visa which got rejected for security reasons. Then my father who is already in Dubai applied for my visit visa which also got rejected for the same reason. I can provide with all the documentation you need to help me out in this case. Still waiting for reply sir. It is looking like you have an Labour ban due to late Labour Card cancellation, or maybe you owned immigration ban. can you please provide us with your passport and visa details here? Kindly let me know in case you need any other information. Please be in touch with us. I am sorry to be bothering you so much. My mum has cancer and she is being treated in UAE, have not met her for the past 1 year which is why it is so urgent for me. I will really appreciate if you people can assist me. We've checked your Visa Details. It seems you have rejection from Immigration department due to some unknown reason. Please apply for visit or tourist visa, and try once again, or send your father to immigration department to check the confirm reason for you, as you are clear in MOL system. If you want us to check for you with immigration, it will take sometime. Can i get your number so my father can call you or maybe you can call him if i give you his number? Because my father has already applied for visit visa but it got rejected as well and upon checking with the authorities he was not given proper replies. If possible check it for me then because my dad was not given proper responses. Any updates on the same? Still waiting for reply from you guys. I have been followed your blogs and from there I have got this e-mail id. I just want your comment on my case of Life time Immigration ban. I have entered in UAE in December 2009 and worked until December 2010 as an office staff in a valid visa. My company was a contracting establishment and we had a project in Abu Dhabi in the last quarter of 2010. In December 2010, we had a salary issue in the company, and some of the employee filed an appeal in the Ajman Labour Dept, and just after that, within a week I got arrested by some CID's along with other 5 employees including the two filed the appeal and sent to jail for almost 20 days. Deported to Mumbai (India) which is 1000 KM away from home with an empty pocket. Here comes to the matter, I'm having a lifetime Immigration ban to UAE now, without doing a crime. The case filed against me is absconding even though it is not true. I have been working for the company even two days before I got arrested. Even They have issued me a salary slip for the month of November 2010. Then how it treated as absconding? I never did a crime nor absconded from the company rather I work for the company sincerely. The management haven't have a good relation with the Sponsor and even they had some fights even in in-front of us in the first week of December. It is true that the Sponsor have found a way to solve the issues permanently by cancel all the visas and giving them lifetime ban. But we, who have paid 1 lakh Indian Rupees for Visa and worked only an year came as victims..!The two managers still in Dubai without any problem and we people got sucked. Is it possible to challenge this issue into MOL..? Please let me know the possible ways to lift this ban up and possibly enter to UAE once again. Please send your Passport Name and Number, let us first confirm the reason from Immigration. Thank you so Much for your concern...!! hello sir.i just want to ask regarding to my situation.i was hired on june 15 2013 and terminated last august 13 2013 under the probitionary period.due to invalid reason and i was cancelled on october 30 2013 by the ministry of interior.since the i try to apply for another job.i find a job and they give me a offer letter on september 14 2013.i went to the previous company and i spoke to the pro that they are willing to give me a copy of the cancellation of labor card and all the documents needed for the transferring to the new company and also i give one copy of offer letter to them.a few month I still waiting for the approval of the new visa.new company (PRO) told me to get my passport from the previous company and they said to me that I will not give your passport until your not received the new visa from the new company.i have no choice to file a complaint with regard to holding of my passport at the abu dhabi court which i did so and advised me to go to khaldiya police station.after they advise me to go to mina police station with the help of the CID in mina police station and was able to get back my passport.i give my passport to the new company and they said keep it for the safety needed.a few days.the new company applying for the new visa its was rejected because of the remarks noted in arabic translation by the ministry of interior below (entry permit new visa) by the previous company.i have no choice to settle this problem. i call the PRO to the previous company.they as me to pay the amount 3100 dirham from the settlement.i pay the amount and he told me. by tomorrow we will go to the immigration office to settle this problem.its was cancelled. on february 9 2014 we went to the immigration office to settle the problem with the PRO from the previous company. i was arrested by the immigration police and went to jail by 9 days and deported..
sir..i just wanted to know it is possible to enter again and find the new job in the UAE.what kind of visa possible. I am hoping for immediately response. thank you sir..and more power. So, in above case you have to found some Emirati (Local Citizen) to submit(report) a case for you in Court. If you won the case, U.A.E will say you "Welcome to UAE"
Our kind wishes will be with you. Formerly im an ex-abroad in Abu Dhabi for almost 11 years legally from year 2002-2013. But after my last company finished year 2013 my contract in real estate as secretary, i tried & find work for another company same field but unfortunately they did not give me a working visa they're just keep telling they're going to make visa until i stayed for almost 1 year and 7 months (jan. 25, 2014 - July 10, 2015) without visa. So i decided to go Phil. Embassy to relay my status until they send me to Al Wathba (July 8, 2015; 10:00am) for one & half day only. To make the story short i was deported (July 10, 2015). In this regard, may i know if i can still come back to UAE. What kind of ban they gave regarding may case. Should i need to pay to clear from immigration. Because I still want to come back to UAE to take chance to work again. Any help extended to my request would be highly appreciated. As per Government of United Arab Emirates and Immigration Law a person who didn’t leave the country after his/her Grace period his/her name will be shortlisted in Blacklist, he/she will face immigration ban and should pay 100 AED per Day if stays more than 1 year illegally.